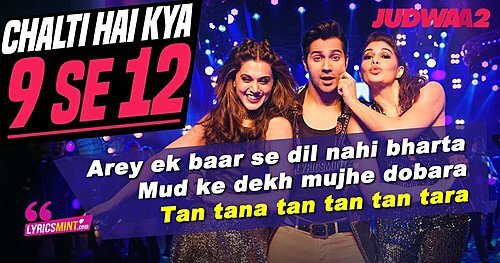 Chalti Hai Kya 9 Se 12 Lyrics – Judwaa 2: The first song from David Dhawan’s Judwaa 2 starring Varun Dhawan, Jacqueline Fernandez and Taapsee Pannu. The new “Tan Tana Tan” is sung by Dev Negi and Neha Kakkar which was originally composed by Anu Malik. The new one has music produced by Sandeep Shirodkar while song uses the original lyrics penned by Dev Kohli.